2 flute, carbide tipped with totally enclosed ball bearing guide. Ideal for beveling and decorative edges. 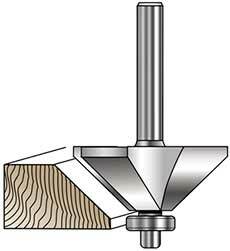 Also used for producing a 45° edge for mitres. Use #5376/#7677 for making square frames, #7680 for making hexagon frames, #5379/#7679 for making octagon frames, and #5378/#7678 for making 12 sided (dodecagon) frames. In the past I used my table saw to cut 45 deg angles on my wood projects. It took lots of hand finishing work to get true edges. I bought a 45 deg chamfer bit thinking it would save time but took over a year to actually use it on a special project. A custom fireplace mantle for a very close friend. No mistakes allowed. It was amazing. Joint lines that are true, square and in perfect alignment the first time. Seemingly instantly. The edge seams on the fireplace mantle (over 6' long) are INVISIBLE !!!! 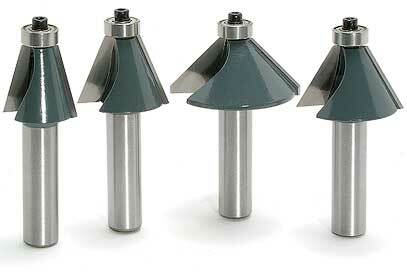 Because of my experience with the 45 deg chamfer bit; I just purchased a 30 deg and 22 1/2 deg chamfer bits. Once you use one - you will wonder why you did it the hard way. Includes four 1/2" shank chamfer bits! SAVE $20! Includes four 1/2" shank carbide tipped chamfer router bits: #7678, #7679. #7680, #7677. List $87.